Last week, the 2008 MLB Amateur Draft was held and the Tampa Bay Rays made Tim Beckham the #1 overall pick. The high school shortstop joins Josh Hamilton, Delmon Young and last year’s David Price as the fourth player to be drafted first overall by the Rays franchise. The two most recent, Price and Beckham, are the only ones still with the team, but Hamilton and Young are having successful seasons in Texas & Minnesota, respectively. Combine that with Price’s early success (1.16 ERA through four starts) and the Rays have a pretty solid track record with #1 overall picks. It’s not necessarily a simple thing to achieve. Sure, when an Alex Rodriguez or Ken Griffey Jr. is sitting out there, it sure looks like a slam-dunk in hindsight. It is perceived that the baseball draft delivers more busts from the top slot than any other major sport. That could be due to the fact that it’s almost always a hike through the minors for a draft pick before we see them on the team or it could just be another one of the many misnomers embedded into the general sports landscape that often go unchecked. Until now. 1-4: For those with a completed career, they never amounted to much of anything. Some of them knocked around for awhile, but that was due more to someone buying into the potential as opposed to any legitimate production they had put up. 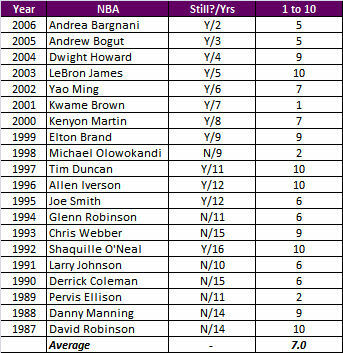 Those with a year or two under their belt and score below 5 are players that haven’t made a huge impact yet. The 1s probably won’t, while the 2s, 3s and 4s have shown something and definitely enough to avoid the dreaded bust label that is often doled far too soon in this instant gratification society that sports lives in today. 5-7: Completed careers in this range were viable players with a number of high quality seasons on their record, but never delivered the overwhelming excellence expected of an overall #1. They might’ve had a season as the best player on their team, but they weren’t ever considered the best at their position if even for a season. Solid pieces, but not franchise players. 8-10: They panned out. These picks yielded (or current yield) solid production for an extended period of time. Usually, they were/are legitimate superstars that not only represent their franchise, but oftentimes their sport. Based on this scale, which sport delivers the most busts atop the draft? We’ll countdown from the league with the best success rate to lowest of the four. LeBron James (6’8”), Allen Iverson (6’0”), Elton Brand (6’8”), Glenn Robinson (6’7”) and Larry Johnson (6’6”) are the only five players of the 20 that are less than 6 feet, 9 inches. Eight of the players are measured at 6 feet, 11 inches or better. Though the five below produced three superstars (James, Iverson and Brand), it appears that adhering to the draft size first mantra of the NBA is a relatively safe bet. 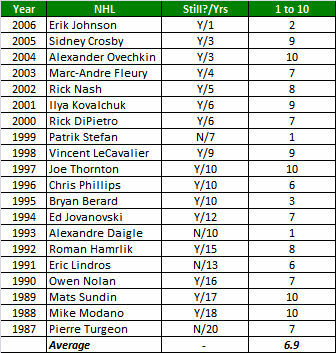 Many of you likely won’t recognize several of the 20 names listed in the hockey table found below so you will have to trust my judgment on the quality of these players. With nine players in the 8-10 range, including five 10s, the front office men in the NHL are doing their homework. Even more impressive is that only four of the 20 players are out of hockey. Only four players (not the same four, but some overlap) rated below six. Despite the strength of their drafts, they fell just short of the NBA with a 6.9 overall average. The two decade block is bookended with a pair of superstars on each end. Crosby and Ovechkin (though Crosby significantly more so) are the face of the NHL right now. Granted that face isn’t seen all that much, the Stanley Cup Finals that included Crosby facing the league’s best team over the past 10-15 years (Detroit) was on the best rated in recent memory. On that other end, Modano and Sundin are among the tops to ever lace ‘em up. Well there goes the suspense! Baseball is not the stingiest league in delivering premier players from the top spot, but that doesn’t mean you are assured a bona fide producer if you happen to land the top choice. 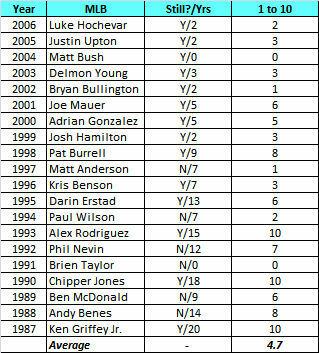 There are three 10s among the list and there hasn’t been one since 1993 (Alex Rodriguez). In fairness to my favorite game, players can and very often do take much longer to develop into superstars meaning the likes of Justin Upton, Delmon Young, Joe Mauer, Adrian Gonzalez and the resurrected Josh Hamilton could all climb the ranks in the upcoming 5-7 years. For now, MLB rates a 4.7 average thanks housing both 0 rankings and eight others below 4. Of course, this won’t shock any familiar with the game. Baseball talent is so deep that the league holds a draft (50 rounds) more than seven times longer than hockey and football and 25 times as long as basketball. A team can bomb a #1 overall pick but hit on six or seven more of the remaining 49 picks and consider it a successful draft. From 1987 to 2006, the average number of players to make it to the major leagues 170 from an average of 1520 players drafted (11%). Only two of the eight picks from 1999-2006 look like they are going to fail as top picks. Hochevar, Upton and Young really deserve incomplete grades because the sample sizes to date are just far too small. Same could be said for Gonzalez, Mauer and Hamilton to a degree in we’re being honest. The Tigers could’ve used current GM Dave Dombrowski back in 1997 when they idiotically selected Matt Anderson. Perhaps he’d have seen the potential in Anderson’s teammate, Lance Berkman, who went to the Houston Astros 15 picks later. Easily the most popular draft of the four, the annual gathering in New York offers the biggest dud rate. 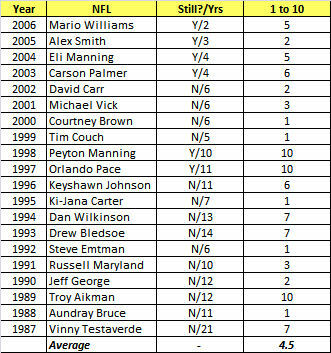 Consider right off the bat that only seven of the last 20 top picks are even in the game and one is in federal prison. Given the physical demands of the game, it’s not terribly surprising that so few are still in the game. Ten of the 12 players drafted from 1987 to 1998 played 10 or more seasons so I don’t mean to downplay the overall quality of these #1 picks more than necessary. The 4.6 average is nipping at the heels of baseball’s score to get out of the cellar, but back-to-back bombs from the Browns in 1999 and 2000 with Tim Couch and Courtney Brown certainly haven’t helped matters. Eli Manning’s recent Super Bowl win was good enough for a 1-point boost. I’m not sold on him moving much higher than a five over the course of his career; I just don’t think he has the smarts that his brother displays. Carson Palmer and Mario Williams are two guys I think could rise into the 8-10 range very soon, but that is the league’s best bet for growth as Alex Smith doesn’t appear to be much. So not a ton of shocking conclusions drawn here. Basketball needs to deliver the best talent from its draft picks unless it wants the same teams to dominate year-in and year-out. Meanwhile, football holds a 53-man roster and baseball holds a 25-man roster plus several minor league teams therefore the talent runs deep and the stage is set for it to developed over time, especially in baseball. Hockey has a seven round draft like football, but age is not as necessary as it is in football and baseball. You will never see a 19-year or 20-year old stealing headlines in baseball and it’s not possible in football. And though it is big, important news in basketball and hockey, it isn’t a once-in-a-blue-moon situation. The Tampa Bay Rays have the deck stacked against them when it comes to Tim Beckham’s success given the current career paths of their previous three #1s, but a strong organization that properly handles its kids can overcome “the odds” and the Rays are definitely showing they have what it takes to be considered a first class minor league system.